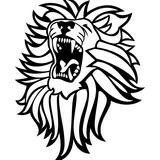 Have you experienced the cathartic effect of roaring? Nothing quite beats the satisfaction of opening the fridge door, usually when you're just about to snap, and unleashing the biggest lioness roar at the milk and veg. The day I discovered my inner roar started off quite normally. I just had Joe (3) and Amber (1) then but even though it was 3 years ago I remember it well. It must've been the afternoon as the mums were all walking past my house to collect their children from the local school around the corner. I had obviously been tested to new heights and basically snapped. The playroom was littered with plastic and my eldest was insisting on getting even more toys out, whilst hurling a toy golf club around. Of course it had to land on my face, causing my cheek to throb wildly. Weeks of accumulated broken sleep, the endless daily rituals of picking stuff up and the constant stream on demands resulted in me turning into a toddler myself. I royally flipped. The mums walking past my house were in for a right treat. They would've witnessed a ranting dishevelled woman, throwing armfuls of plastic toys out into her front driveway. They might've noted a bright orange toy golf club complete with green crocodile ball collector if they were able to take their eyes off crazy lady spouting gibberish. I have to admit it did feel quite liberating. I had to sneak back out later to sheepishly gather up the sea of scattered toys in case my neighbours thought I was running some sort of haphazard toy sale. There are countless other times I've shamefully lost the plot and regressed to shouting like a frustrated three year old. I remember when Joe was quite young I was driven to the edge and it had something to do with Fireman Sam because a snapped CD ended up in the bin that afternoon. Then there was the bread incident. I'd cooked dinner (actually made it from scratch) and of course they didn't want it, they wanted beans on toast. It was New Years Eve and all I wanted was for them to get to bed so we could crack on with the evening and relax. So I made them beans on toast, but I'd cut the toast up wrong. Pushed, pushed and then snap! Pieces of bread hurtled around the kitchen like a magician performing some elaborate card trick. Then the slices were ripped up before I announced that I needed a few minutes to myself (I'd learnt to give myself 'time out' by then which basically meant I needed some space). I'll finish off with the lego flip because I could just keep going. If you've got a child who is mad about Lego I'm sure you'll appreciate this. 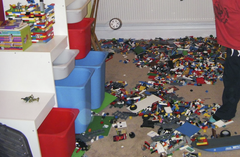 That noise when you know the massive sack of Lego has been tipped (again!) all over the bedroom floor. My heart sinks because then Joe insists on taking all the Lego figures' heads off, then legs, arms and even their hands! Seriously, who does this? I like to feel in control of most situations but there's one area I've lost hope with and that's Joe's bedroom. Some mothers appear like they would never snap, flip or roar but I like to think that we all have our limits. Some of us just reach them quicker due to a combination of reasons. Full time mums generally stand closer to their inner roar buttons. Mothers with children who are particularly exasperating, or at least feel like they are after 5pm, are likely to enjoy a good roar. Single mothers (I salute you) or Mumma's with partners that work away or late should all fluff their manes proudly. If it enables us to cling to the coat tails of sanity, it must be healthy to have a quick roar in private from time to time... I'd love to hear your 'roaring' stories if you have one to share.